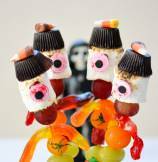 When I was thinking for suitable name for this candy creation, the first set of words that jumbled-up in my mind were..... "Marshmallow Candy Kabobs" and second were.... "yum yumm"! 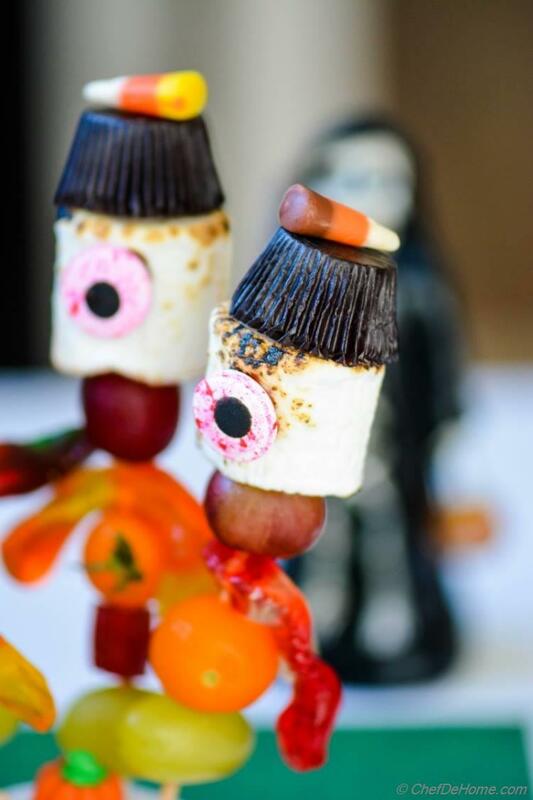 There is something about s'more-ish toasted, soft, and pillow-y marshmallow, candies, and word kabobs which made me salivating in an instance! 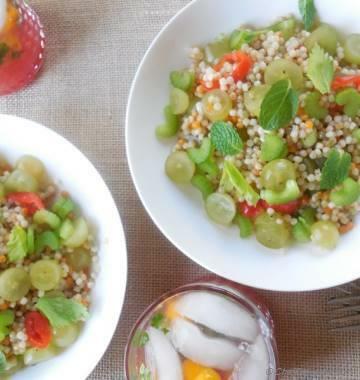 I did succeeded a bit.... by skewing two kinds of grapes and a ripe golden cherry tomato in each stick! The ratio of candies to fruits is almost 50:50, which is pretty good for a festival where kid's mouth are jam-packed with candies and candies only! 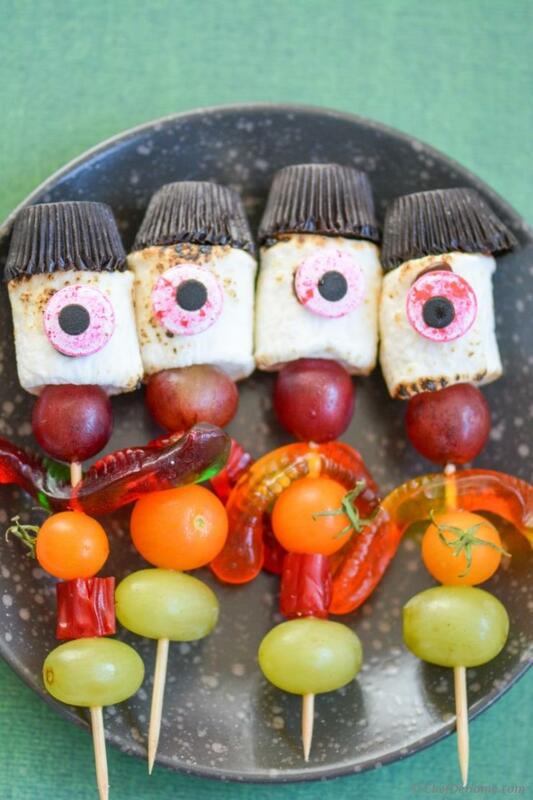 I figured Marshmallows and mini-peanut butter cups will be enticing and grapes will add little element of freshness. I not had any berries at home or I would have skewed few blueberries or raspberries too! You can always use candied natural fruits instead of sugar candies to reduce the sugar further. Assembly of these kabobs is easy. But, the first step is very important. Since marshmallows are supposed to be lightly toasted. First skew marshmallow onto sticks and take'em far to the blunt-other-end of the stick, whip clean the rest of stick with a wet and clean paper towel. Toast each marshmallow for just 4-5 seconds on open flame, be careful, do not to burn stick or marshmallow too much. Then immediately insert peanut cup next to marshmallow's toasted end. Fit it tight and skew a grape from pointed end to secure marshmallow and cup at it's place. Repeat with remaining sticks. Each stick needs about 15-20 seconds. and you are good to go!! Kids can certainly help you with this fun project past toasting step. in fact.. for me.. clicking pictures of these kabobs was a total fun too! I wanted to show this skeleton ghost in pictures to make it look little creepy... but, end-result was rather funny... I can't resist sharing a few with you. Even while selecting pictures for the post, I was laughing out loud! alone!! Look at this first one, rather than scary from any angle, ghost skeleton dear seams scared and hiding, still want to be in picture of marshmallow stick men. lol! Can you spot him?? right there, in right corner behind gorgeous stick-man-kabob!!! He finally gained some courage and stood behind, right in the middle. He never knew, stick men are actually very friendly. They posed to have a picture clicked with their ghost skeleton buddy. I m laughing to tears!!!!! And here is what happened to stick men after befriend-ing selfish skelton! hmm... looks like my ghost-y skeleton buddy does not like candy, only fruits!!! Have fun guys, I really enjoyed every bit of this post today, hoping you will too! Happy Halloween (in advance of course)! 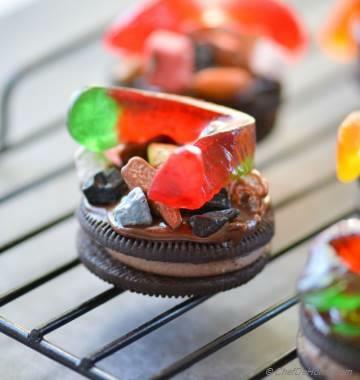 Smart Swap You can also use candied fruits instead of sugar candies. 1. 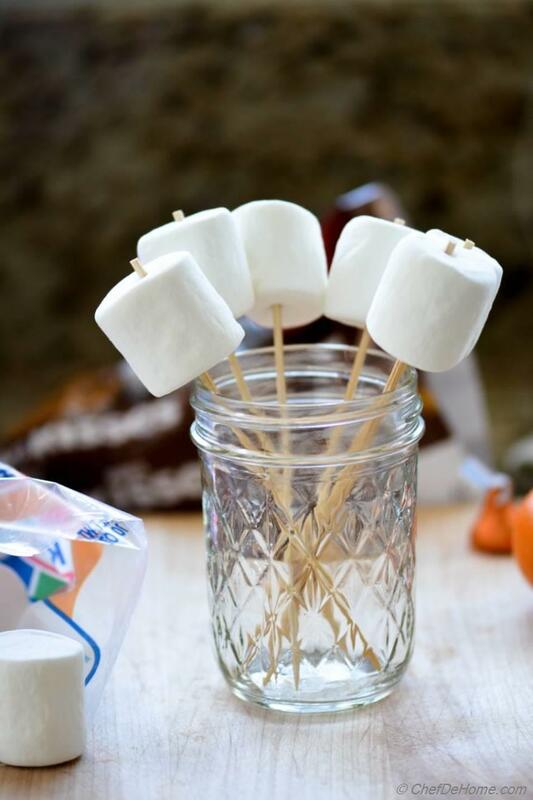 Skew marshmallow onto sticks and take'em far to the blunt-other-end of the stick, whip clean the rest of stick with a wet and clean paper towel. 2. 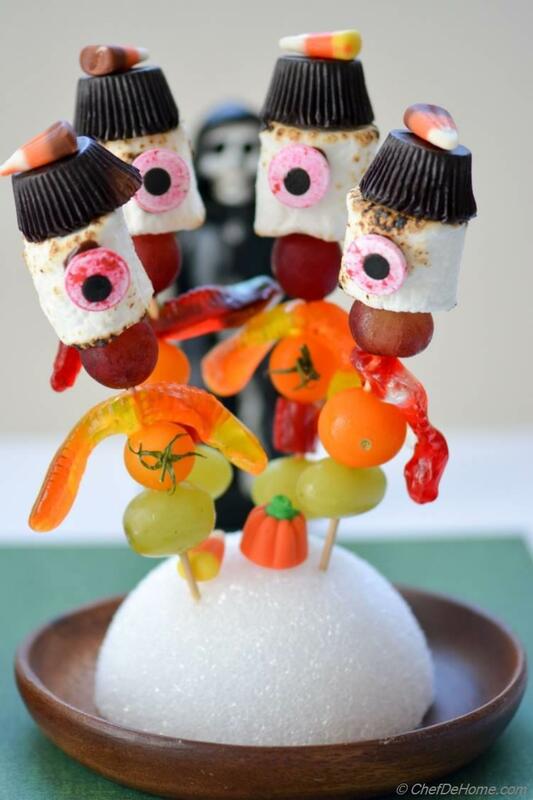 Toast each marshmallow for just 4-5 seconds on open flame, be careful, do not to burn stick or marshmallow too much. Then immediately insert peanut cup next to marshmallow's toasted end. Fit it tight and skew a grape from pointed end to secure marshmallow and cup at it's place. Repeat with all remaining 20 sticks. 3. 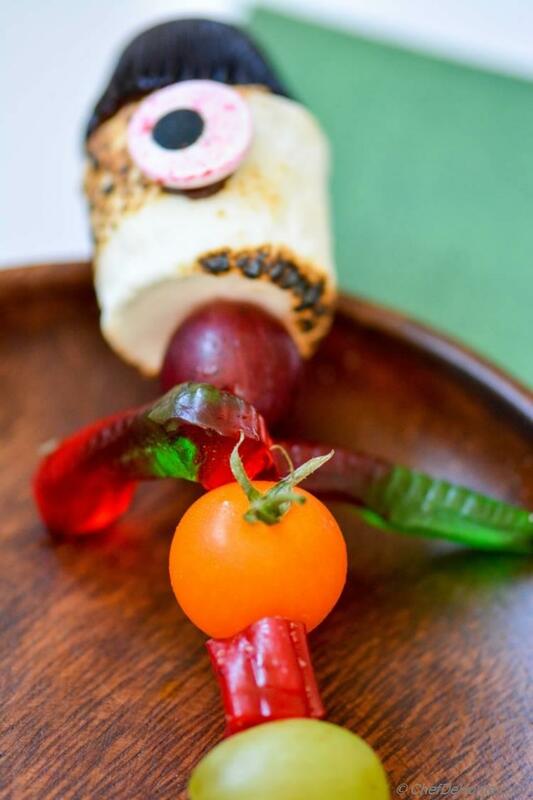 Now, skew, gummy worm in each stick to make arms, followed by cherry tomato, grapes, and piece of liquorice (if using). 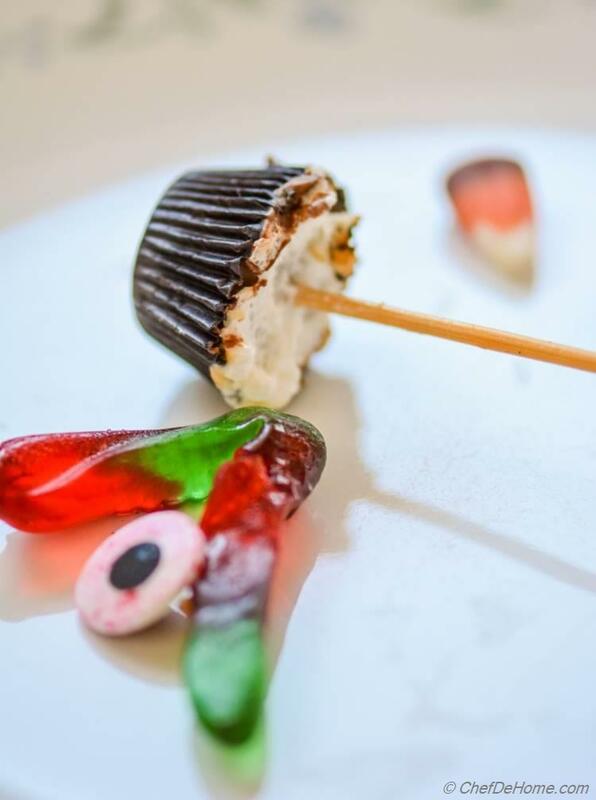 Carefully glue eye balls and candy corn(if using) with chocolate frosting. 4. Arrange assembled pieces on platter, then refrigerate for at-least 30 minutes so that everything is set and then serve! Anu, thanks dear! I'm so glad Adoria will like it. @nina, @preety, and @Cintella, thank you all so much! great story, great recipe. 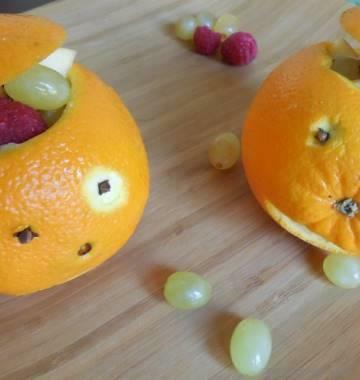 I will make these for my son. 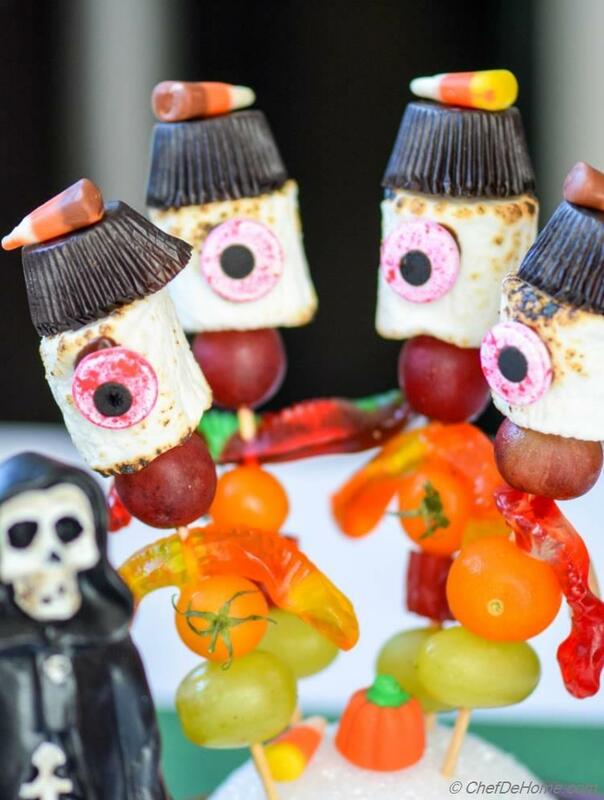 got to make these candy men! sounds fun! !